I’m excited to hear from so many of you who have set intentional goals to do more healthy eating this year, and now I’ve got some exciting news for you. 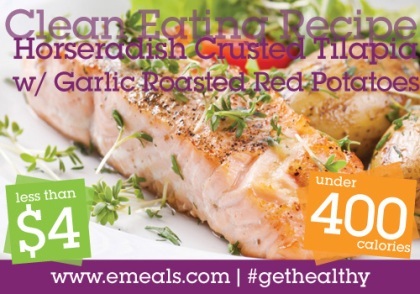 My friends at eMeals have created a new Clean Eating Plan. They’ve planned the meals and organized the shopping list for you to be able to serve your family wonderfully fresh meals every night with natural ingredients. Many of the recipes are under 400 calories and less than $4 per serving, like the one I’m sharing with you below: Horseradish Crusted Tilapia with Garlic Roasted Red Potatoes. Horseradish Crusted Tilapia Recipe from eMeals Plus Subscription Discount Code! Heat oven to 375 degrees. Toss potatoes with olive oil, garlic, salt, and pepper. Bake on a rimmed baking sheet for 45 minutes, stirring once halfway through cooking time.